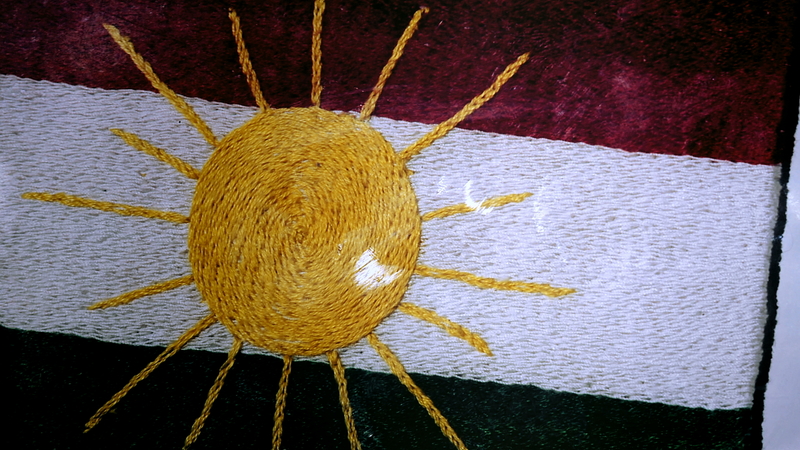 In 1946, a 14-year-old bride played a key part in Middle Eastern history by making the iconic flag for one of the first independent Kurdish states of the 20th century. The Kurdish Republic of Mahabad was founded in Iran on 22 January 1946, five months after the end of the Second World War. Supported by the Soviet Union, it existed for less than one year. But the flag still symbolises the Kurdish dream of independence. It was the second self-proclaimed Kurdish state to rise and fall within 20 years. The first was the Republic of Ararat which was declared in 1927 and then vanquished by the Turkish military in 1930. The story of the Mahabad flag begins in 1945 when Fatima Assad Shahin married Nahman Issa in a small town just south of Iraq’s border with Turkey, a wedding that the legendary Kurdish leader, Mullah Mustafa Barzani, paid for. Nahman and his new wife joined thousands of Barzani tribesmen as they fled with their families and livestock across the Zagros mountains to Iran. Mullah Mustafa had led a failed uprising against the Iraqi central government and his partisan force was now being chased by the Iraqi airforce. Nahman was one of his fighters. FATIMA ASSAD SHAHIN explains how she travelled to Iran with her husband Nahman and Mullah Mustafa Barzani to support the Kurdish uprising led by Qazi Mohammed. In 1946 Mullah Mustafa told Nahman they needed a flag for the short lived Kurdish Republic of Mahabad. ‘Can you do it?’ he asked his wife. 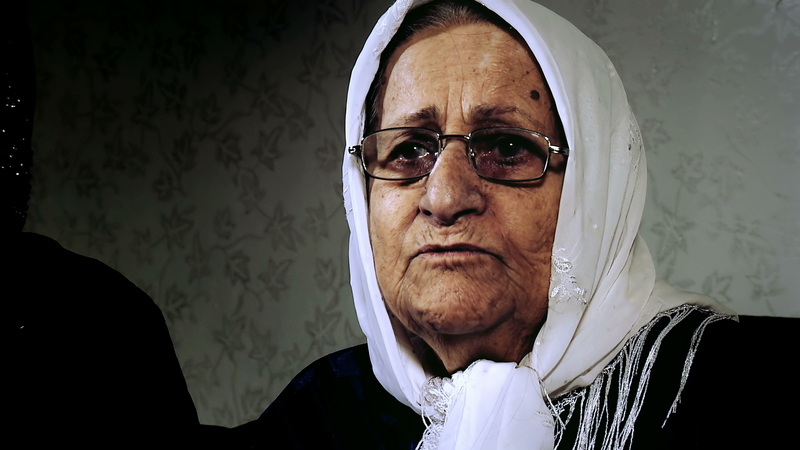 ‘Yes’, she answered and sewed an icon of Kurdistan. Mullah Mustafa’s plan was to join the Kurdish uprising in Iran led by judge Qazi Mohammed. The Iraqi Kurdish leader became one of Mahabad’s four generals and he and his fighters provided the backbone of the Mahabad army. He was a man feared by the Iranian military. Thereupon she sewed perhaps the most iconic symbol of Kurdistan ever made. Yet within months Kurdish euphoria melted away as the Soviets began to withdraw support. Later that year it became clear that the Mahabad Republic could not survive and in an emotional meeting Qazi Mohammed handed the Kurdish flag made by Fatima to Mullah Mustafa. Qazi refused to flee with him to the USSR. The Mahabad Republic collapsed in December 1946 when the Iranian army secured the city and Qazi Mohammed was hanged in March 1947. In a dramatic and successful escape, Mullah Mustafa Barzani fled with 500 followers to the USSR carrying Fatima’s flag with him. The flag is now held by his son, Masoud Barzani, President of the Kurdistan Region. Nahman Issa became mayor of Rawanduz but fell ill after a meal with Iraqi government officials in 1972. He had been poisoned and died shortly afterwards, according to Fatima. Fatima died in July 2012 in Erbil. Mahabad is a Kurdish city situated in Iran, near the border with Iraq. In January 1946 the Kurdish republic of Mahabad was declared, but it collapsed in December 1946 after the Iranian army secured the city.